The remains of a buried pine forest at the foot of Mont Saint Genis in Southern France yield insightful information on a drastic climate change event. The pine tree stand initiated around 12,900 years ago during the relatively warm "Allerød" period, and continued growing into the cold snap of the "Younger Dryas" period. Researchers at the GFZ German Research Centre for Geosciences in Potsdam, together with international colleagues, have for the first time combined classic tree-ring width measurements with chemical (stable isotope) analyses of carbon and oxygen in tree-rings to reconstruct climate variables. Thus, they were able to calculate local soil water composition (precipitation) and relative humidity at annual time resolution. This resulted in novel insights into the hydrological variability and atmospheric circulation changes during an abrupt climate change event. The team reports about its findings in the journal Scientific Reports. The sudden cold snap in the northern hemisphere between 12,700 and 11,600 years ago has been found in climate records from Greenland ice cores and Central European lake sediments. It was named after the mountain avens (Latin: Dryas octopetala) – an Arctic plant species that predominantly spreads during cold conditions. 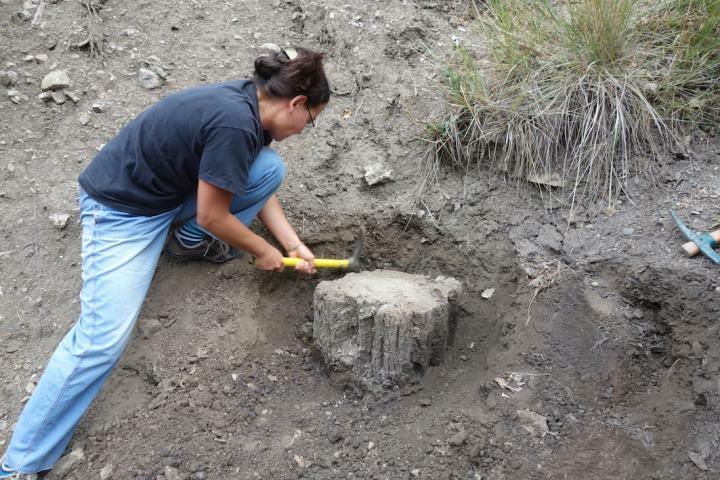 The discovery of fossil pines in a French river valley near Avignon now close an important knowledge gap, as they shows how the climate in the Mediterranean changed in this period. With accurate radiocarbon dating, the scientists were able to prove that the buried pines had started their growth in the warm days of the Allerød just before the Younger Dryas and had survived the sudden cold snap for several decades. They were thus witnesses of this extreme climate change. In their analyzes, the researchers found signs of increased air mass transport from the North Atlantic. "We were surprised that about sixty years before the actual climate change, a significant alteration in the precipitation source was recognized," says first author Maren Pauly of the GFZ. According to the results, humid air masses arriving from the Atlantic side enhanced, while rainfall originating from the Mediterranean side diminished, evidenced by a steadily increasing variability of the oxygen isotopes of the soil water. Isotopes are atoms with a different number of neutrons in the nucleus. From the ratios of light and heavy isotopes conclusions can be drawn on the origin of air masses and thus of precipitation. "Especially striking is the increase of extreme polar air surges, winter precipitation and winter storms at the beginning of the Younger Dryas," adds Achim Brauer, Head of GFZ's section Climate Dynamics and Landscape Evolution and Director of Department 5 at GFZ. Maren Pauly works as a PhD student in his group. With this study, the scientists proved that it was not a change in mean temperatures that was problematic, but rather the environmental stress presumably leading to the tree die off. This stress was caused by the accumulation of extreme weather conditions in single years or even decades. In general, this study shows that periods of massive climate change can be associated with more instability in atmospheric circulation patterns, leading to greater variability on annual or decadal scales. "Here, paleoclimate research shows how it can close knowledge gaps with information from natural climate archives," says Achim Brauer. This is also important because "we lack experience on what exactly happens during a sudden climate change, how quickly the climate can change, and what regional differences occur."